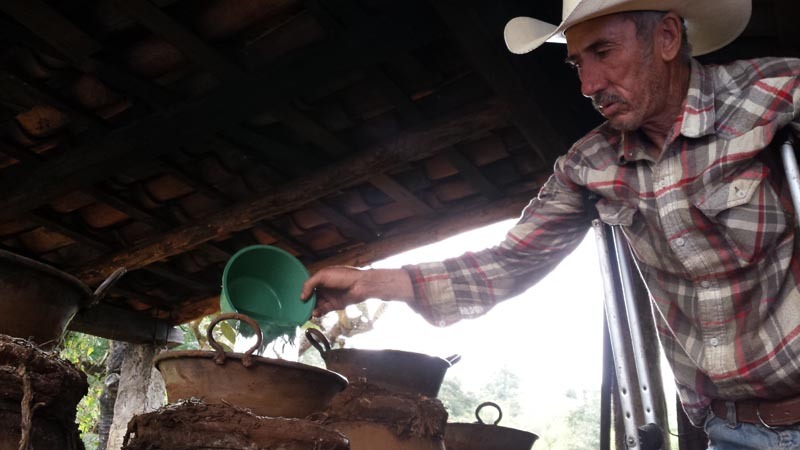 Clay stills are smaller than the copper potstills used for artisanal mezcal. 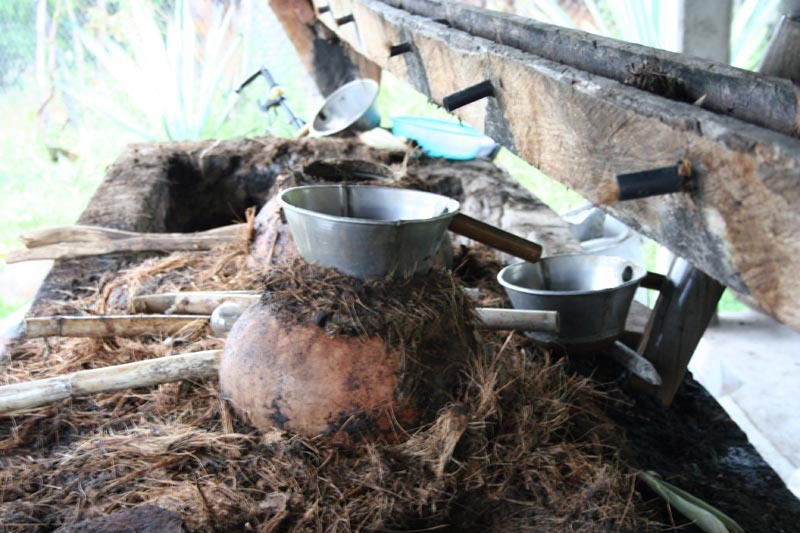 Clay pots impart a soft and colloidal texture – a distinctive mouthfeel – to mezcals made in them. 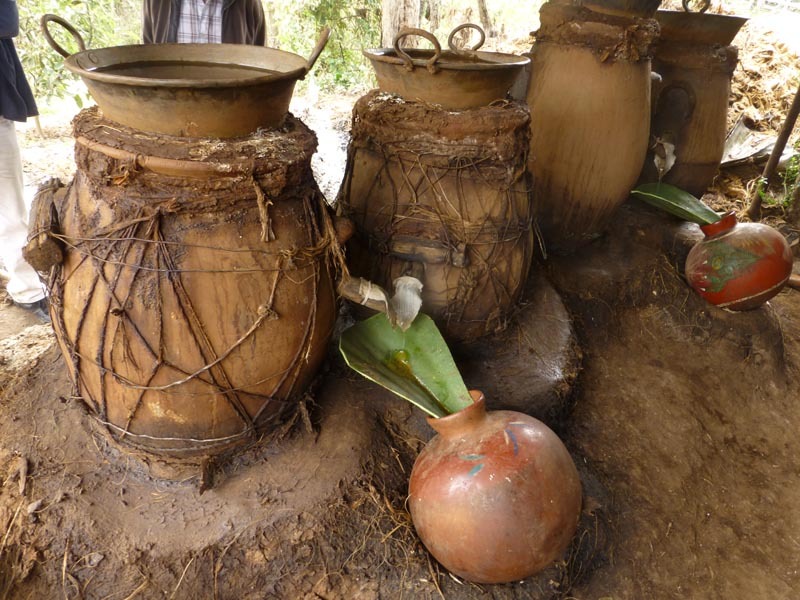 Four clay potstills of the kind used in Oaxaca.The masonry adobe base encloses the bottom clay pots, above the ovens (each oven serves two pots). On top, are the upper condensing pots, with bamboo tubes to carry the distillate out, and above them is a flexible pipe supplying cooling water, each pot with its own valve. All potstills have a large lower pot and an upper chamber. The distillate is brought to a boil in the lower chamber, and steam rises into the upper chamber. 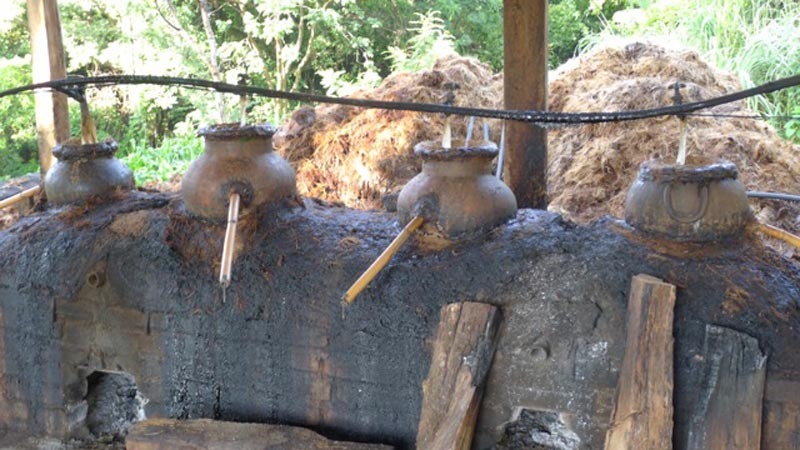 In the standard Oaxacan copper potstill, the upper chanber is small and feeds a long tube to a separate condensing coil, which is in a tank constantly fed with cool water. 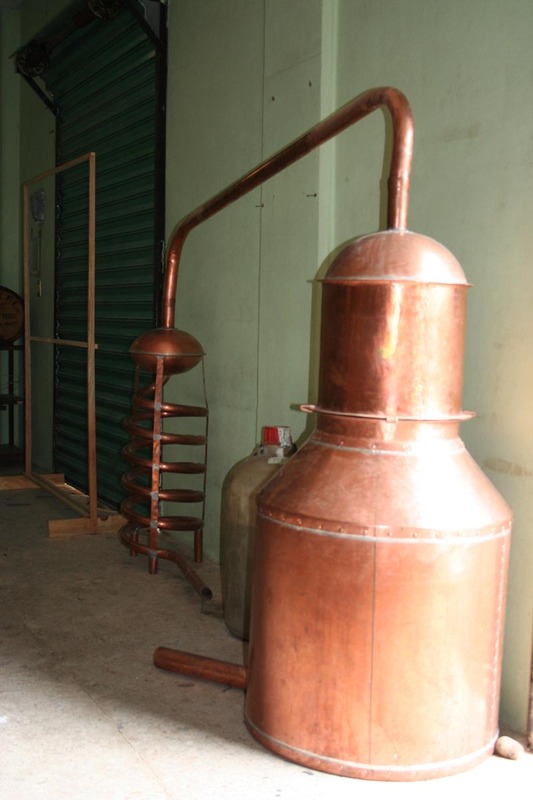 Here’s a copper still, with the condensing coil in back. Clay pots have a much larger upper chamber and do not use a condensing coil. 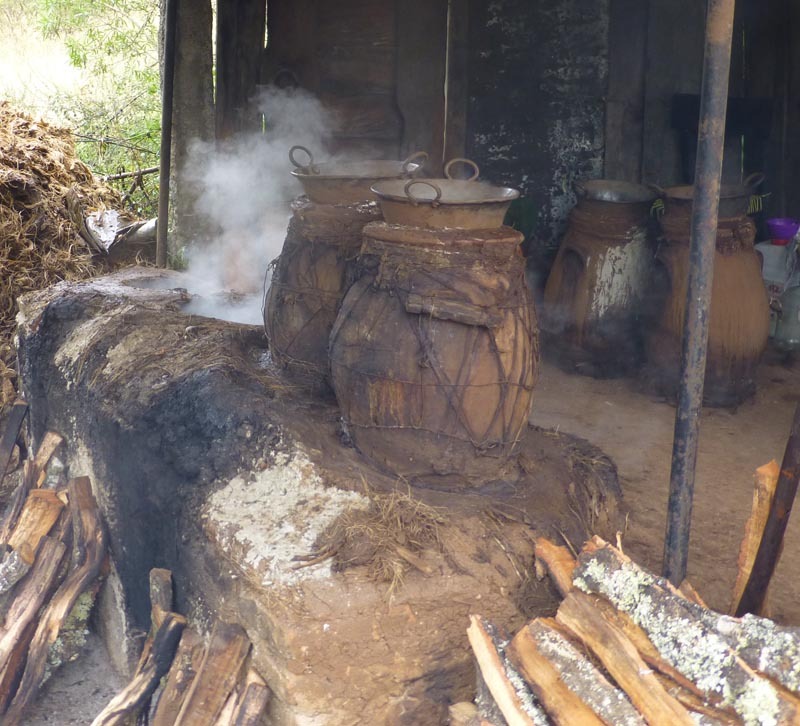 The following photographs were taken at the destilería of Don Luis Contreras, who distills an artisanal mezcal called raicilla in the Sierra Negra Mountains of Jalisco. Don Luis distills for La Venenosa, the beautiful raicilla imported by Estéban Garibi. 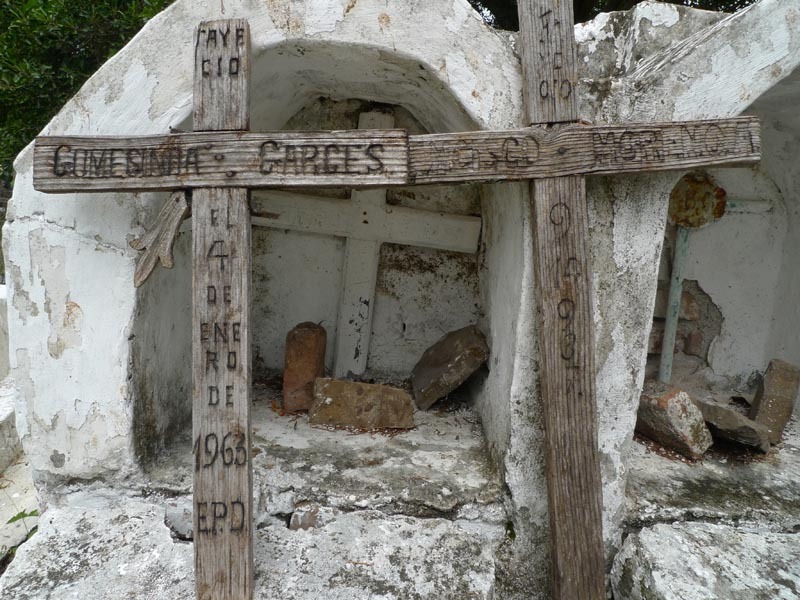 Here you see Don Luis’ four clay stills. The two on the right have their upper chambers in place; the two on the left show only the tops of the bottom pots, steaming at the end of a distillation run. Note the saucers on top of the upper chambers. When the still is running, steam from the heated distillate in the bottom pot rises into the upper chamber. 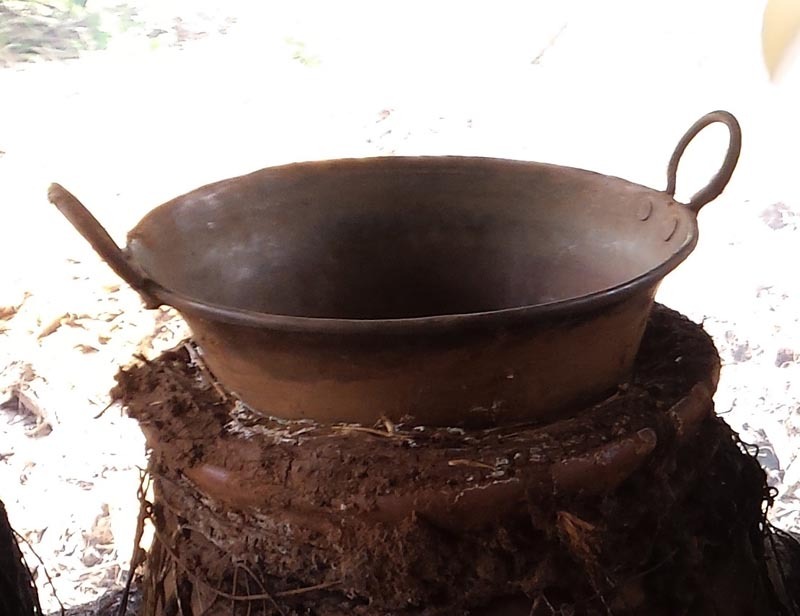 Clay potstills have a at copper saucer on top of their opening. Cold water is constantly added to the saucer. The steam condenses into drops when it hits the cool bottom of the saucer. Looking down into an upper chamber. The condensed drops fall onto a collector inside the chamber, and run out through a hole in the side of the chamber, usually through a bamboo tube. 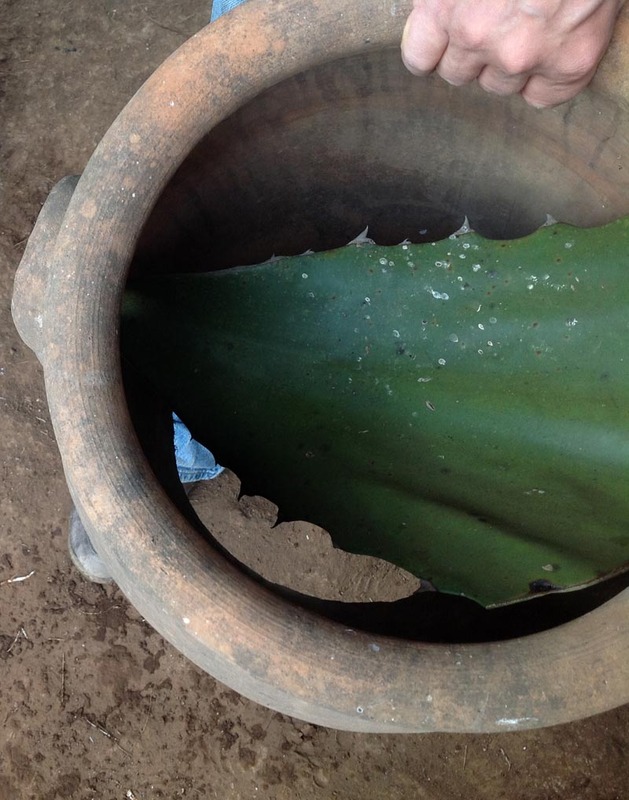 Don Luis uses a trimmed agave leaf as a collector. 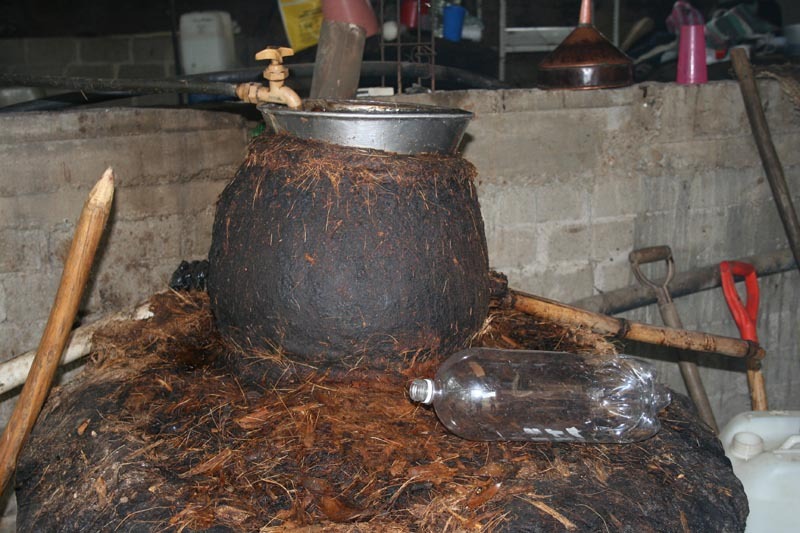 Don Luis uses another trimmed agave leaf to funnel the condensed distillate into a pot. You can see the water in the saucer on top of the still’s upper chamber, at left. A clay pot at Real Minera. The spigot is feeding cool water into the saucer. The distillate is running out the bamboo tube directly into a container at right. 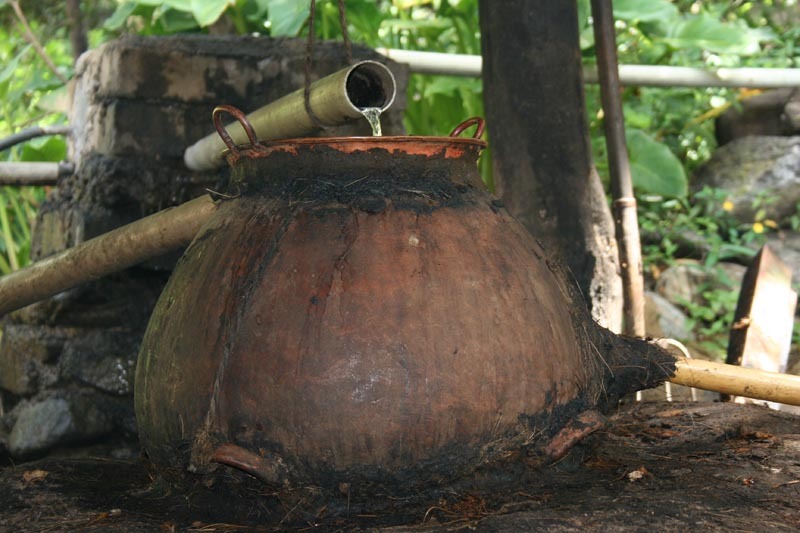 A clay pot distillery using a wooden trough and tubes for the cooling water. This man simply stuffs grass into the tube to control the flow. Note the deep steel saucer for condensing the distillate. Some distillers still use iron saucers, which slightly discolor the distillate with rust. You can taste it. Rusty mezcal is called colorado. Old-timers like it better. 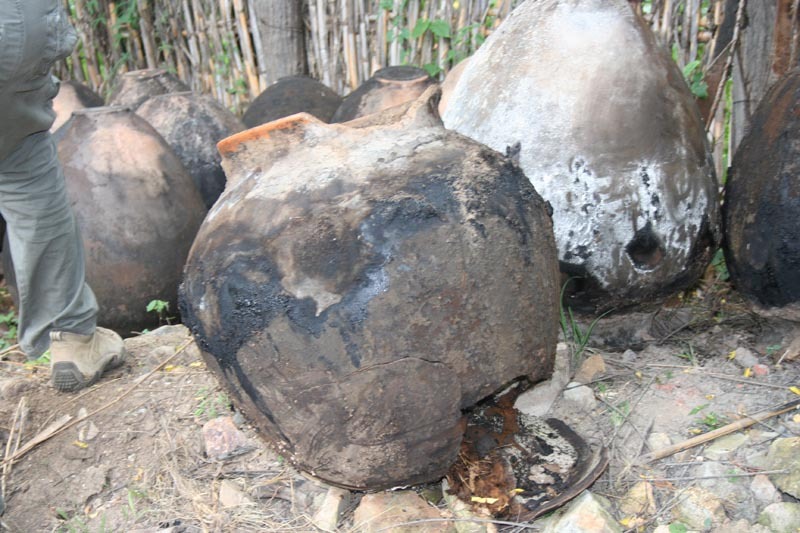 All clay-pot distilleries have old broken potstills lying around.